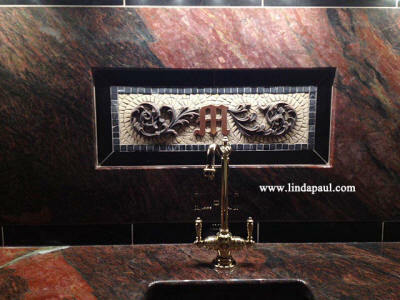 Linda Paul's Tuscany in the Mist border tiles have been designed to go around the entire bathroom. What a great idea! Green Butterfly by Linda Paul looks great with white tile. Hang over existing tile or install frame and all between other tile. 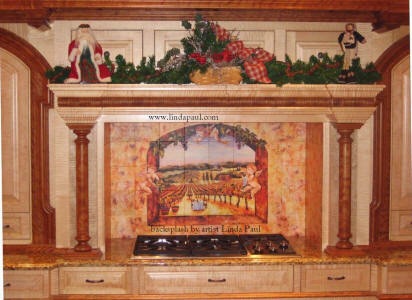 This 60" x 42" custom mural of our Italian Kitchen backsplash was installed in this remodeled kitchen. The tiles were cut into an arch at the top to fit the existing black tile. 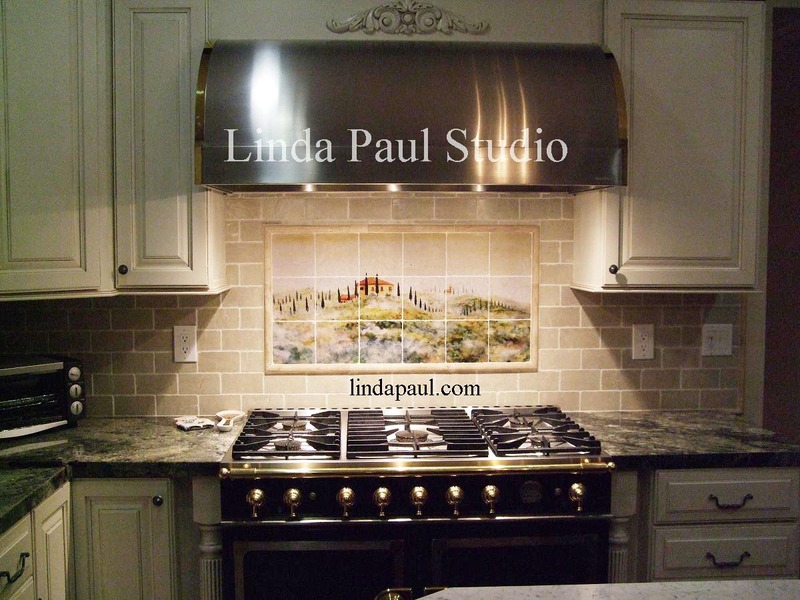 Installing two stove tops instead of a large one is a great idea from both an economic and functional standpoint. 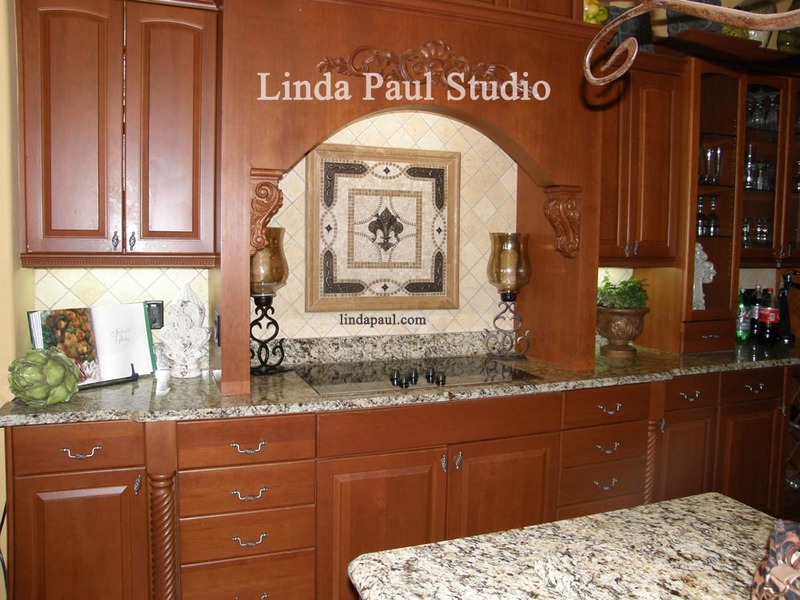 The Rachel's flower metal accents come in 6 different sizes and 19 metal finishes. 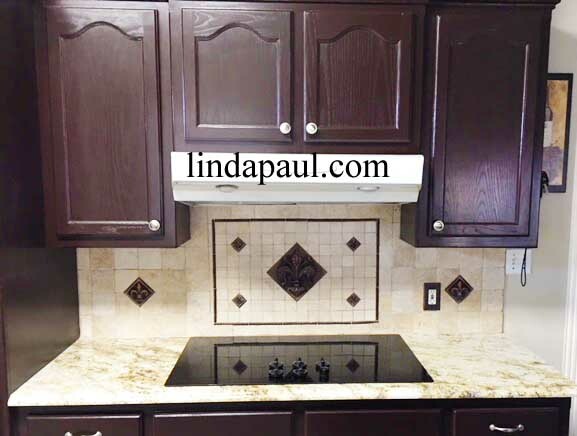 Just a single accent can make a fabulous statement in your backsplash. 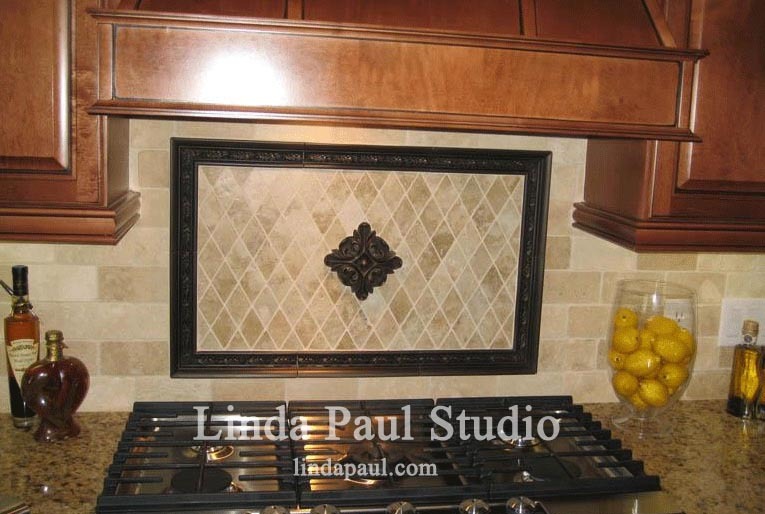 To create a simple and affordable backsplash design, change the direction and shape of the tile with in a backsplash. 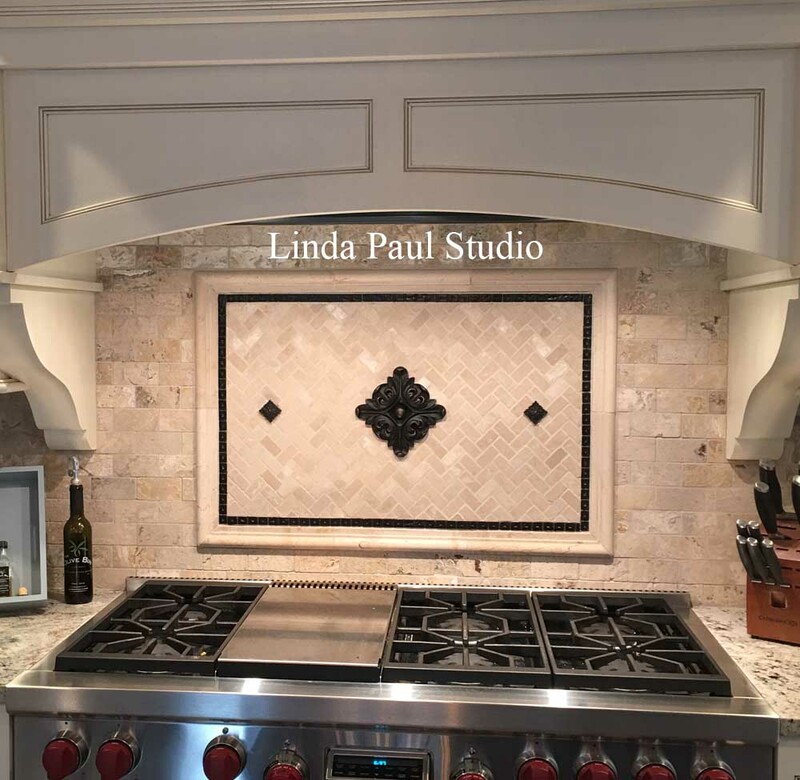 In the picture, there are diamond shaped stone tiles in the central area and subway brick shaped tile outside of the border. 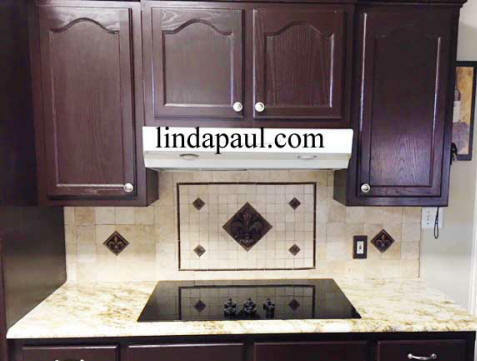 This customer installed the Bellagio listello liner in his solid granite bar backsplash. We customized a copper M for the center of the design. 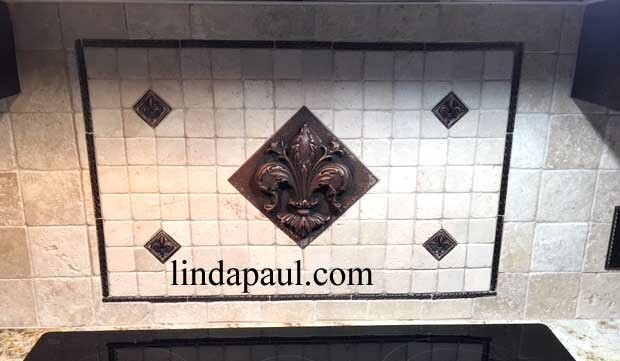 Fleur de Lis Backsplash by Linda Paul Studio. 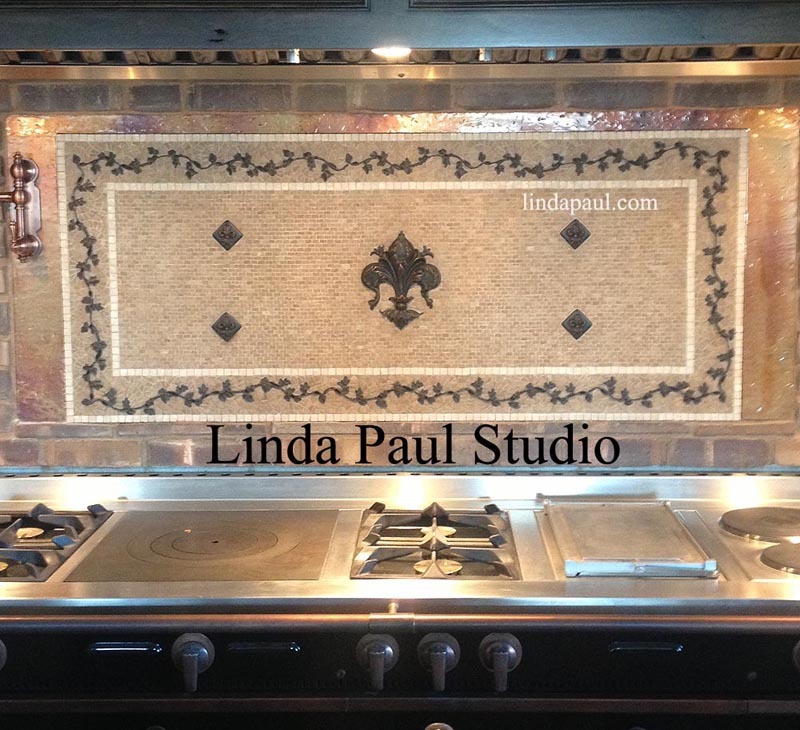 Stunning Custom 56 x 24" mosaic tile kitchen back splash with metal fleur de lis accents and wandering vine border in copper oil rubbed finish. 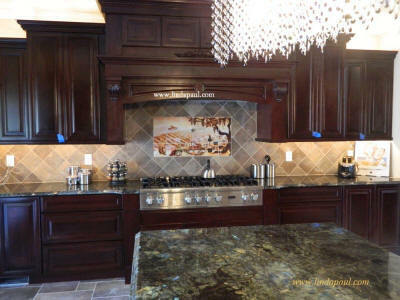 Check out these kitchen backsplash pictures sent in by one of our customers. 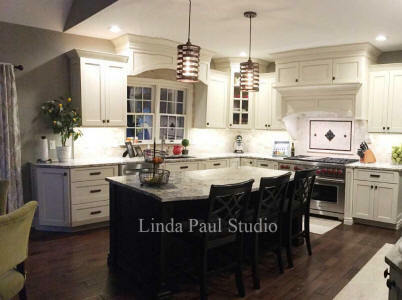 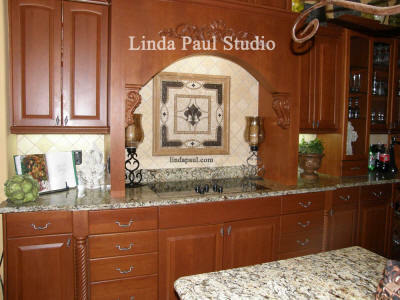 The kitchen is dream in glazed cream cabinets with the star of the show being our Chateau Grape Medallion backsplash. 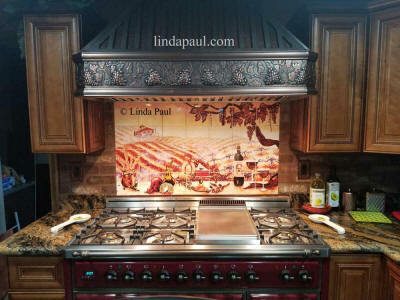 The medallion is a custom 20" x 20" size with bronze oil rubbed metal grape and grapevine accents. 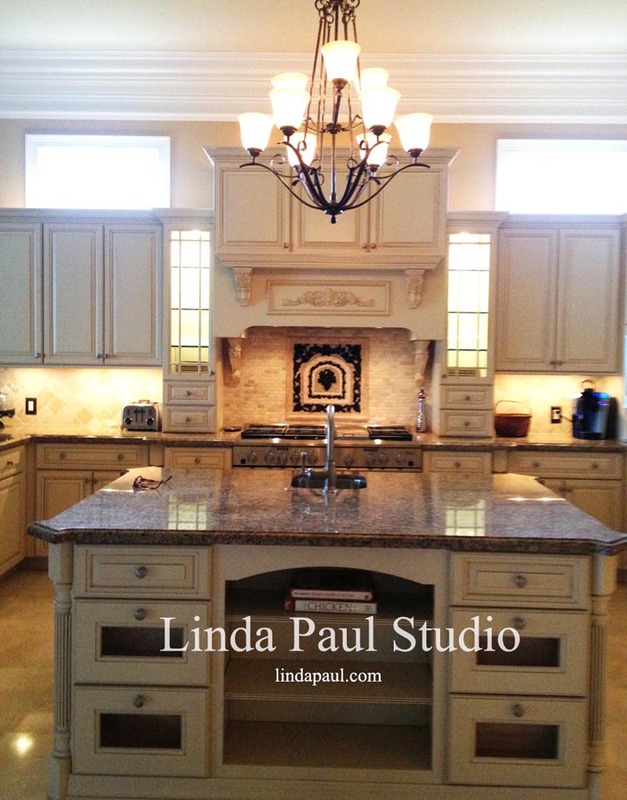 The small subway tiles surrounding the medallion are the perfect touch. Love the custom hood and korbels. From artist Linda Paul! 24" x 24" size of my original dragonfly pas de deux created behind a single piece of glass. 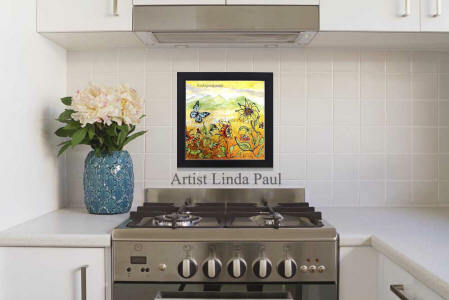 Can be purchased with or without a frame. 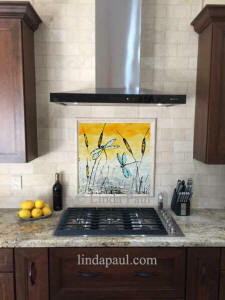 Hang over existing tile or granite or install between your tiles - framed or unframed . 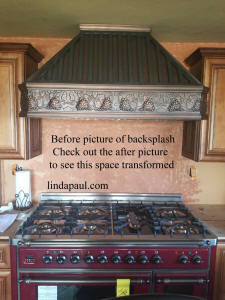 Transform a plain backsplash space into something unique and spectacular. 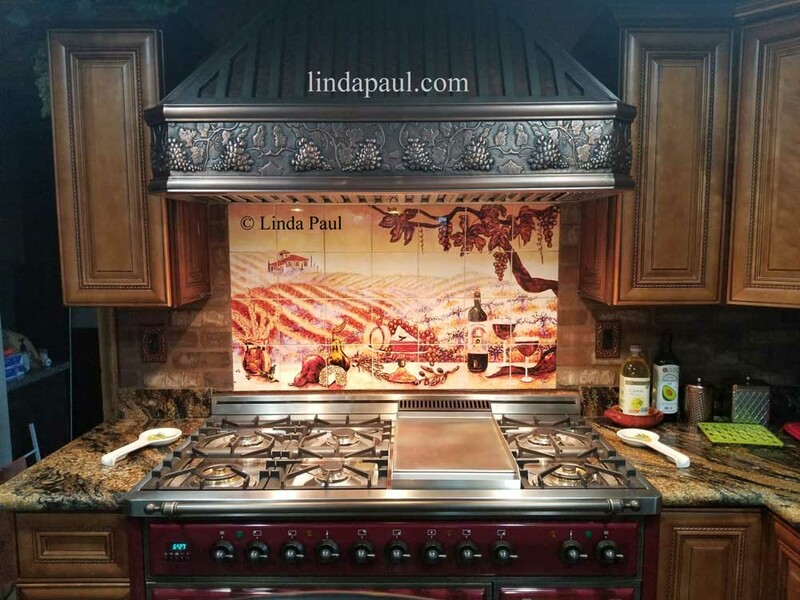 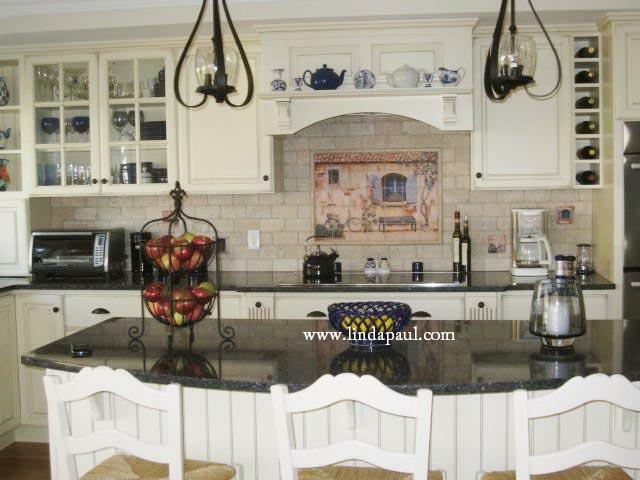 A spectacular kitchen backsplash idea that creates the perfect Tuscan kitchen. 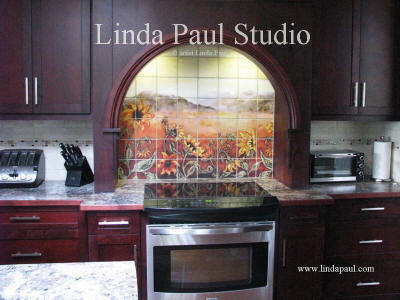 See how the tile design incorporates the 3x6 subway tile next to the counter, then 6x6 tiles above. 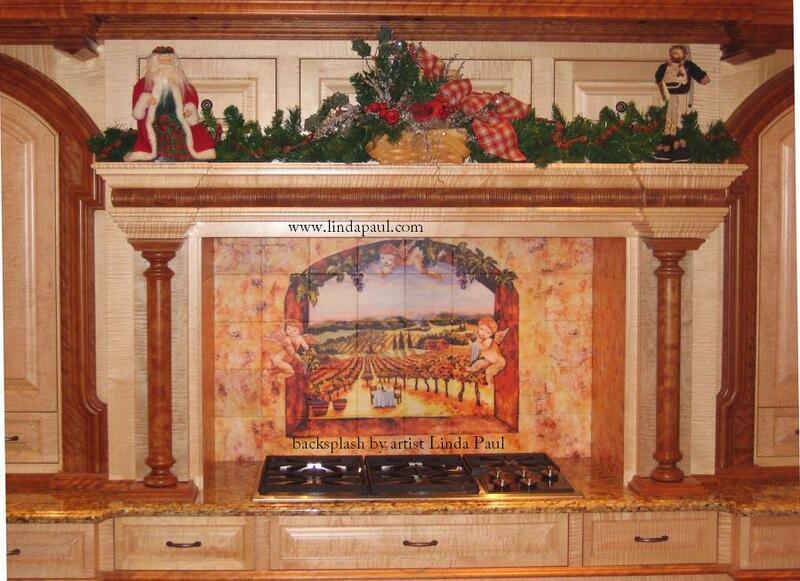 Wine Cellar Mural Tuscany Window by artist Linda Paul installed in a wine cellar. 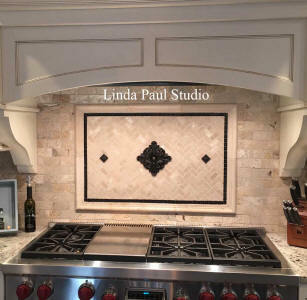 Our stock Grand Vienna fleur de lis stove backsplash tile medallion , shown with cherry cabinets and Noche tile border. 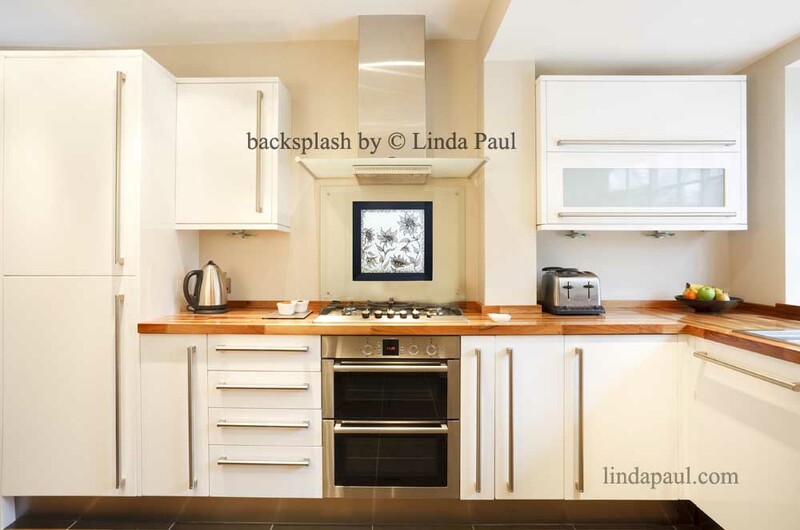 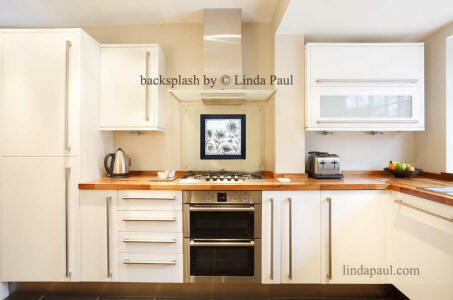 A small kitchen can have a big impact with my black, white and silver sunflowers glass art as the focal point. The silver in the artwork matches the large silver cabinet handles and stainless hood and range top. The black border of the sunflowers goes perfect with the black glass on the front panel of the ovens. 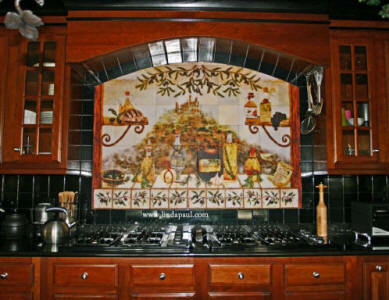 Having the backsplash art made from one piece of glass is a clean look that compliments the other glass in the kitchen. 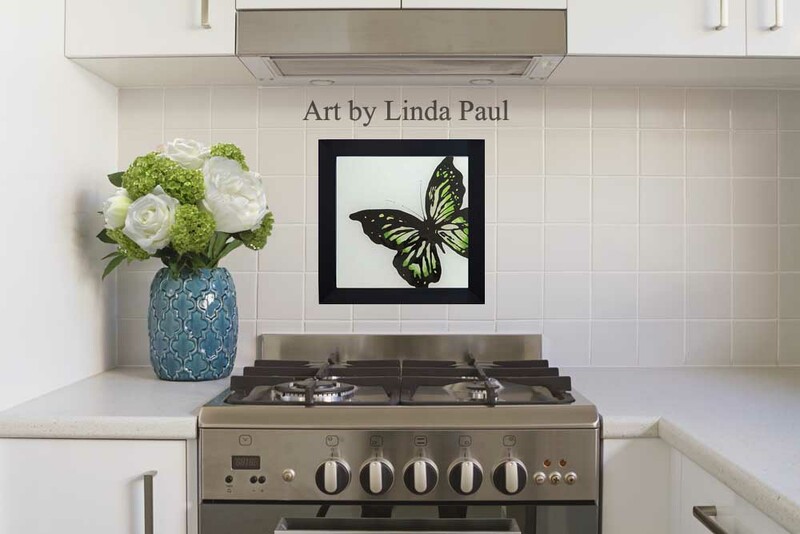 This original backsplash art can be hung as temporary removable framed backsplash or installed directly onto another sheet of glass or your backsplash tiles.